The latest Yarn Forward, No 33, features the mysterious and elusive Bob Jenkinson. Some time ago, Filey Museum’s lovely staff gave me permission to use this photo. But there was no real provenance for it – just amongst a batch of things donated long before there was a protocol in place to record the whos and wheres, I’d guess. So I went in search of Bob Jenkinson. He proved elusive- like all the best men. I’ll chart this gansey’s pattern in my forthcoming book about the history of Yorkshire knitting – for anyone who’d like to knit it. I re-wrote the article as I wasn’t happy with it – too much genealogy, too little knitting – and in the light of some info the nice gents at The Scarborough Maritime Heritage Museum gave me, when I chatted with them a couple of months back. But I think the layout etc was already done, and YF were happy with the copy they already had. Have I ever said how much I love Yarn Forward? Here’s the re-write of Bob Jenkinson, for those who are interested. We have some great ‘Knitting Genies’ coming up – a 1920’s knitted dress, and the earliest known photo of English angora bunnies, and hopefully, the earliest extant photo of a possibly Yorkshire knit stripey gansey. For now, here’s Bob in his later, unpublished incarnation. Stood in front of his nasturtium-clad cottage in a forgotten early summer, Bob Jenkinson wears his gansey proudly. The Museum have no date for this photograph – just the subject’s name written on the back. The photographer is unknown, but likely to be a professional, given the clarity of detail and the deliberate soft focus of the nasturtium leaves in the background. The photo is good enough for us to be able to recreate this gansey stitch by stitch, if we wanted to! Bob’s gansey is a typical Filey one – vertical allover patterns, divided by ropes. Like many mariners, Bob wore the 2 X 2 ribbed welt turned upwards. The cast on is a strong one – possibly a knotted one, given its firm line. Above the welt, the knitter appears to have worked at least 30 rows plain. Somewhere in this area, hidden under his moleskin jacket, she is likely to have worked Bob’s initials.The quality of the knitting really shows in that plain section above the welt. Filey Museum have some old sets of needles on display – they are plain steel, somewhere around 2.5mm. Then the pattern begins. Like most Filey ganseys, it is an allover pattern in vertical bands, divided by six stitch ‘ropes’ (cables). The ropes stand out against a background of moss or purl stitches. The gansey has a simple 2 X 2 ribbed neck and we can’t see the shoulder treatment. The neck is finished in the traditional way. Before crew necks or polo necks, ganseys were often given a collar of about 2” of 2X2 ribbing, completed with 2 rounds of purl stitch, and 2 rounds of plain. Bob wears a neckchief beneath this, to keep out the draughts! It is a relatively straightforward piece of knitting – the ropes divided with strips of seeding stitches, in this case Mary Ann’s stitch/basket stitch. Ropes in ganseys are never mirrored, rarely complex and typically just 6 or 8 stitches wide. This gansey, like most others, will no doubt have been knitted from a commercial yarn – Poppleton’s 5 ply worsted. 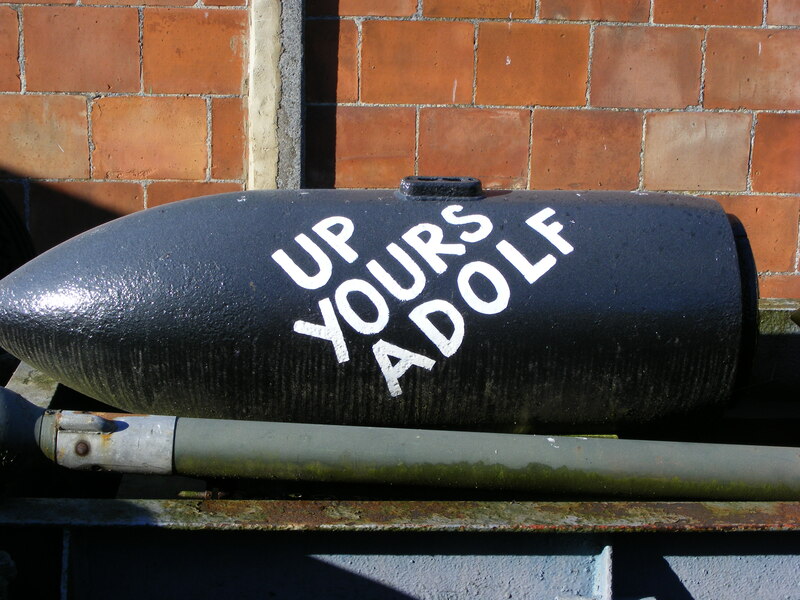 (In Yorkshire called ‘wassit’). Using my genealogical sleuthing superpowers, I went in search of ‘Robert Jenkinson’ – and found several in Filey. The Jenkinsons were a notoriously complicated fishing family. Even the volunteers at the Scarborough Maritime Heritage Museum had heard of the family’s complexity, and told me it was a huge family, with one offshoot in Scarborough. I’d dated this picture around the 1880s, going by Bob’s hairstyle and jacket. He looks to be in his late 50s/early 60s and sure enough, three Robert Jenkinsons fitted the picture. All three Roberts were listed in Censuses as ‘Fisherman’! In the 1881 Census, close to the photo’s date, only one Robert remained in Filey. The other one lived at a village a short distance away and the third turned up as master of a vessel, the George Peabody. The vessel was a 40 ton cod fishing ‘dandy’ out of Hull. I realised, it was impossible to be sure which Bob Jenkinson this was. “FILEY SUDDEN DEATH – On Tuesday Mr Robert Jenkinson, fisherman, of Alma-terrace Filey, suddenly expired in his chair at home. The deceased was apparently in his usual health. He was a leading man in the Primitive Methodist Society. He has for many years gone round the town with the Primitive singers, and was with them on Christmas Day in excellent spirits”. The logical conclusion is that if the image predates 1882, it could be any of the three Bobs! If it postdates December 1882, it can’t be “Master of The George Peabody” Bob! The Scarborough ex fisherman I spoke to, told me that the Filey Singers were almost all what Scarborough folk call “Wessies” (ie: Wesleyan Methodists). Apparently the current Filey Fishermen’s Choir mostly knit their own ganseys. It is possible this gentleman sang in the famous Filey Fishermen’s Choir. We can safely conclude the picture shows a direct descendant of the Robert and Margaret Jenkinson whose children were born in the late 18thC in Filey. And if knitted by a family member, according to Censuses, it was very likely knitted by Elizabeth Jenkinson nee Cammish, or Elizabeth or Rachel Jenkinson, maiden names unknown! 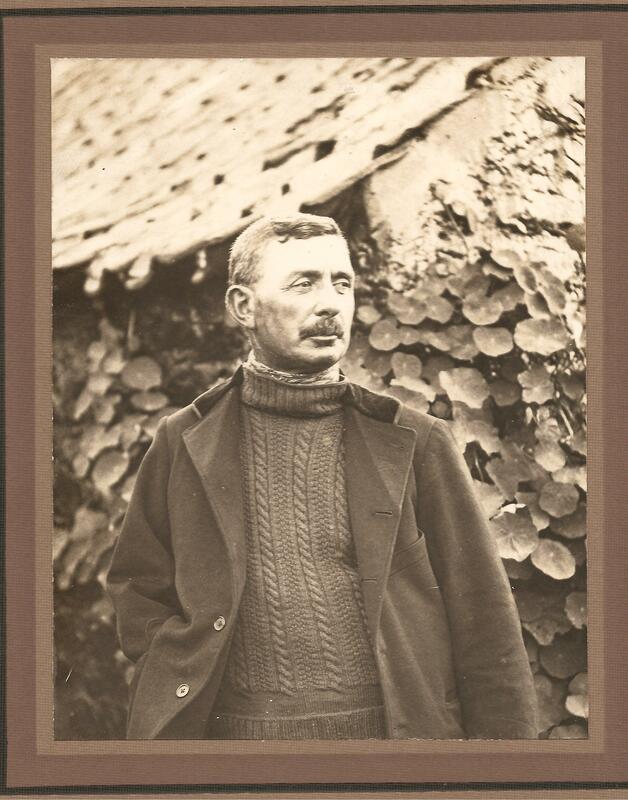 Again, we can come close to not only identifying this Victorian fisherman but even, possibly putting a name to the knitter of his gansey. http://infotrac.galegroup.com/ [For British Library’s 19thC Newspapers Online. Can be accessed via some local libraries]. More wartime knitting. And it’s been a productive week. Here’s dad in Palestine in 1947. Not entirely the sort of place you’d need fingerless gloves, or balaclavas. Although I’m sure he was very glad of them when he got back to rainy old Leeds, later this same year. He does remind me of the men in 1940s/50s knitting patterns though – endlessly smoking and making it look cool, somehow. He was always a pipe man, never saw him with a cigarette. He’d buy tins of tobacco in a tobacconist (still, incredibly there!) on the Market Place in Selby. It’s where I got my obsession with tins, I think – those tobacco tins with pretty pictures on. He stopped smoking when I was a teenager in the 1970s, but he’d still always smoke just one cigar – when he put me back on the train or the National Express coach to university. He smoked to show how proud he was of me! 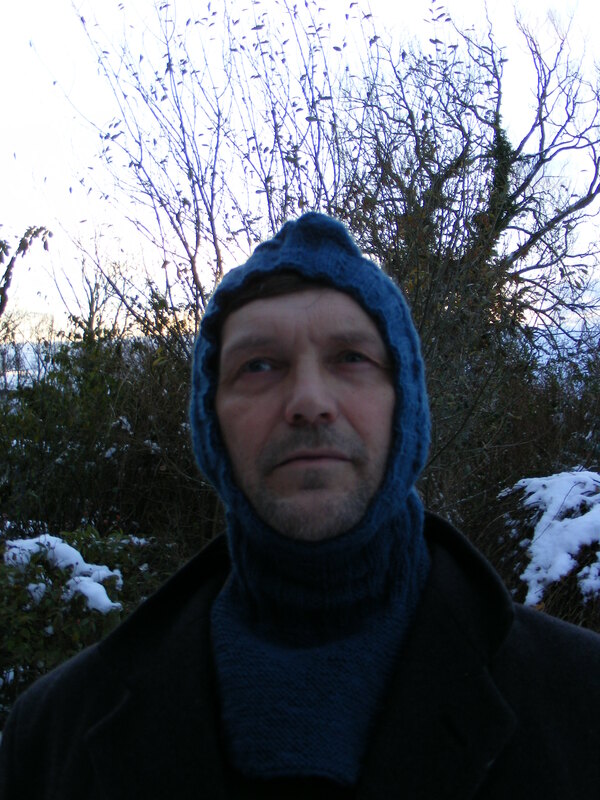 Here’s the balaclava from ‘Knitted Comforts For Servicemen’, Leech-Way Wools. I knitted this precisely as per pattern, using British Breeds guernsey 5 ply wool. That little widow’s peak at the top is down to bad photostyling – he’s since squidged it down. It was the total opposite of the Edwardian balaclava with a bottom up construction. The rapid decreases at the top (actually at the sides once you got halfway up the face) are what give it that shape. It’s much more snug round the face – draught-proof. It’s fine in wear, but we took this hastily before he jumped in the car for work. And then, the matching servicemen’s fingerless gloves. I adapted the gloves heavily as the pattern was written for a finer grist yarn, and also I wanted to do the thumbs and fingers in the way I’m used to. I also closed the thumb with ribbing to prevent it being gappy. You may notice the fingers are knitted a bit shorter than the originals, too. You can play about with that acc. to personal preference, if you want to try knitting these! So, this pattern belongs to an anonymous pattern writer from a WW2 woollen mill, not me. But, I will give you my heavily adapted version which looks identical to the photo in Knitted Comforts, andwas probably much faster to knit! Vintage patterns are great to simply use or adapt – but I never forget the often anonymous original designers! These are going to be invaluable in the current weather as poor Worser Half is outside all day. The 5″ long cuffs alone make them worth the effort – and they’re the work of just 2 evenings at my fairly snaily pace. You can find British Breeds Yarns here. And I hope you do, as British wool is worth promoting and using! See the Campaign For Wool here. I’d imagine with a bit of fiddling, these might work with DK but I used guernsey wool as it’s what I had to hand (geddit?) – plus, it is worsted not woollen spun, so makes the pattern ‘pop’. This 70 year old pattern deserves to be used and out there. 1 set 2.5mm DPNs, or circ for magic loop. Cast on 44 sts (needle 1: 15, needle 2: 15, needle 3: 14 on 3 needles, if using DPNs). Work in K1, P1 rib for 5”. At end of needle one (or, 15 sts in if doing magic loop), Make 1 st purlwise. K 1 round, staying in pattern, purling the new stitch. This is going to be the base of your thumb gusset. Continue to Purl the 2 P sts, and inc 1 st after the first P and before the final P, every 3rd round. 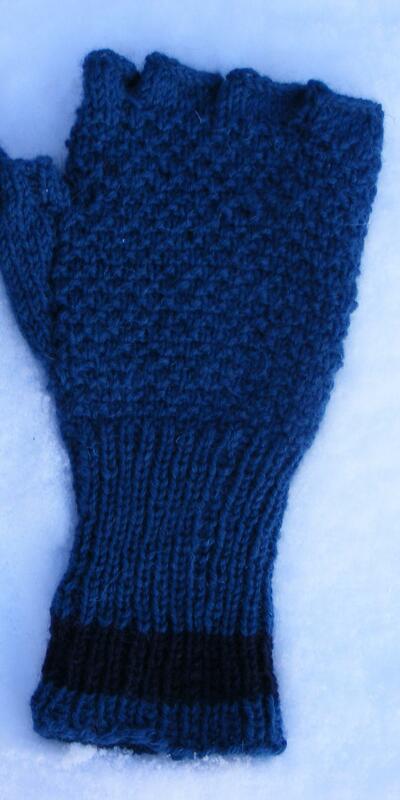 K thumb in stocking stitch, but as you knit it, cont rest of glove in patt. 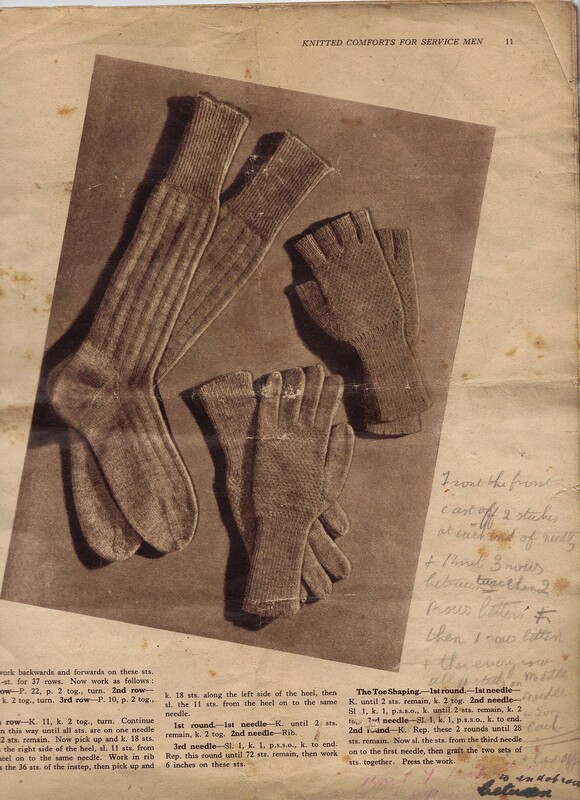 When you have made 11 plain sts (13 sts inc the 2 Ps), place these 13 sts on waste yarn and continue to knit up glove in patt, for 1 and a quarter inches. This completes the patterned part of glove. Do fingers in stocking stitch. Centre Finger 1, over thumb, by using 6 sts from end of needle 1, and 6 sts from start of needle 2. Put rest of sts on waste yarn. K round these 12 sts, M 2 stitches [14 sts], between fingers 1 & 2. K 4 rounds, cast off loosely. Pick up 6 sts from palm side. Pick up 4 sts between Fingers 1 & 2, but immediately (K 2 tog) twice, so you have 2 new sts, not 4 (this eliminates holes). Then, pick up 6 sts from back of hand side and M 2 sts between Fingers 2 & 3. [16 sts]. K 4 rounds, cast off loosely. Pick up 5 sts from palm side, M2 sts , pick up 6 sts from back of hand side, Pick up 4 sts from between fingers 2 & 3 – again, reduce immediately down to 2 by (K 2 tog) twice; [[15 sts], K 4 rounds, cast off loosely. Pick up remaining 10 sts, pick up 5 sts between fingers 3 and 4, K 4 rounds, cast off loosely. Pick up the 13 sts waiting for you. Pick up 3 stitches from side of hand. [16 sts]. Knit 4 rounds in K2, P2 rib. Cast off loosely. Start thumb gusset at end second needle. Knit as per first. Picture Credits: 21stC photos: Alexander Hunt.